In the days when baseball was as prevalent as softball is today, one man stood out among all of the class players. Emery “Dutch” Rauschenberg played through four decades and was active as a coach nearly six. Dutch began his career in 1916, playing centerfield for the Wheeling-Lake Erie team of Neffs, Ohio. He was still playing in 1940 for the Sterling team. Many of these 24 years he carried a batting average in the high .300s or low .400s and was instrumental in driving in the winning run in many games. Teams that he played on during this period from Bellaire, Rittman, Neffs, Big Prairie , Doylestown, and Sterling. Team names of that time were Grains of Health, Riney’s Togs, Doylestown Celtics, Big Prairie-Lakeland Beach and Stewartsville. 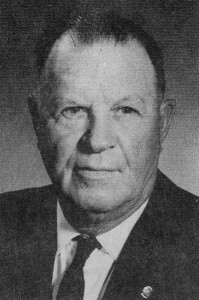 In the late 1930’s, Dutch became a player coach and later a coach only. His son, Delbert (also known as Dutch), played on many of the teams with his father. During World War II, Emery coached a girls softball team. From 1948 until 1959, he coached Slovene Center from Barberton; Ohio boxboard, Rittman’ Canton Road Furniture, Akron; Smith Sheriffs, Akron; Hoover Sweepers, North Canton; Erhart Kramers, Medina; P.O.C., Wadsworth; and Borden Autos, Akron. In all Dutch Rauschenberg played or coached on nearly 30 different teams over a 44 year span. You might say he devoted his entire life to the game at a time long before the “bonus babies” and the million dollar contracts.